You are here: Home » Can my existing gate be automated? In most cases yes, automation can be added to most existing gates. If your gates have hinges that face each other it is a straight forward job. 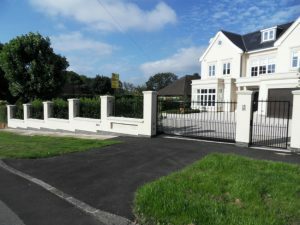 If your gates have hinges that are not facing each other then you can easily have additional brackets or other metalwork fitted. A free site survey will help determine the feasibility and we can discuss what will work best for you – underground motors or rams fixed on to the gate itself. Either hydraulic rams or electro-mechanical motors are mounted on the back of each gate leaf. The final choice of operating system will depend on weight and size of your gate, and whether you are in a particularly windy location. So we would recommend hydraulic rams for a windy site and for heavier gates. In a few situations, underground motors can be fitted to existing gates, but the geometry is the all important and deciding factor. We haven’t come across many existing gates that have been fitted in such a way that underground motors can be added at a later date. The underground motors are more expensive and involve higher installation costs, and there is much more work involved in fitting them. They are much less visible though and give a more discreet finish. We can tell you once we have looked at the gates and the site if this will be a viable option for you. In either case you’ll be able to get high quality and reliable automation guaranteed for 2 years at a cost effective price, with our promise that if you’re not happy with anything we’ve done, we’ll fix it. Find out more about automating existing gates here.